Here's more on the special company owned Fiat dealership opening in January in downtown LA. Called Motor Village of Los Angeles, this dealership will offer the latest in innovative customer service. Special thanks to Sam500, a member of the Fiat500USA Blog forum, for snapping the above photo. 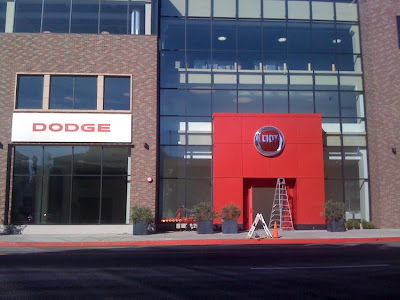 November 15, 2010, Auburn Hills, Mich. - Chrysler Group LLC today unveiled Motor Village of Los Angeles, the company’s newest dealership in the United States. When Motor Village opens for business in the first quarter of 2011, this company-owned dealership in central Los Angeles will not only sell and service vehicles, it will serve as a grand showplace for the Chrysler, Jeep®, Dodge, Ram Truck, Fiat and Mopar® brands. This dealership provides Chrysler Group brands with the platform to try new, innovative and experimental displays, materials, furnishings, processes and customer services. Each Chrysler Group brand will have its own, unique and separate salon. The brand salons will remind customers of the eye-catching displays they would typically see at a major auto show. The four-level Los Angeles Motor Village is strategically located at 2025 South Figueroa St., just blocks from the Los Angeles Convention Center, the Staples Center arena and the L.A. Live sports and entertainment district in downtown Los Angeles. The area attracts millions of visitors each year. When it opens for business, the Motor Village will make an immediate statement. The dealership’s focal point is a dramatic, five-story glass tower that will be used to display Chrysler, Jeep, Dodge, Ram Truck and Fiat vehicles. Three large LED reader boards placed atop the glass tower are designed to spread each brand’s logo and message to everyone driving on the I-110 freeway that runs along the west side of the dealership. More than 350,000 vehicles drive past the dealership daily. Chrysler Group in January began renovations to this building, which once housed a Pierce-Arrow dealership in the 1920s. This showcase dealership will mark the return of the Chrysler Group brands to central Los Angeles after an absence of about 10 years. The Chrysler, Jeep and Dodge brands will occupy the first floor of the dealership, while the Ram Truck brand will be situated on the second floor. In addition, the Fiat brand will have its own, separate entrance to a unique studio. The salons will take on the character of each brand. The Jeep salon, for example, will feature Jeep models situated on realistic-looking rock slabs that you might find in Moab, Utah. The Fiat brand will feature a style center and terrace, while deep, rich woods are prominently used in the Chrysler salon area. The dealership also features a convenient café and a Mopar Speedshop, a showcase for Mopar performance parts, accessories and apparel. Each brand salon will be stylishly marked by new brand signs and kiosk-like information and merchandise towers. The salons also will be equipped with a powerful touchscreen technology called iShowroom. Customers can access feature and competitive information via an advanced interactive kiosk, and even select their vehicle of choice. The Chrysler Group is holding a reception in the dealership Tuesday, Nov. 16 as part of its activities during the Los Angeles Auto Show media preview days. Thanks for sharing this information. Looking forward to reading more updates on the Chrysler Group with the dealership on Los Angeles Auto Show media preview days. HAVE YOU HEARD ABOUT WHAT DEALER IN LAS VEGAS IS GOING TO BE THE FIAT DEALER? THERE IS NO INFORMATION AVAILABLE LOCALLY HERE IN VEGAS AS TO WHO IS GOING TO BE THE FIAT DEALER. I WONDER WHY. Here is a new article on this area. There hasn't been an official announcement yet, as there are many details being ironed out, etc. Hang in there!